On Jan. 5, Colorado State Patrol Trooper Josh Lewis had had enough. With winter conditions rendering roads slippery across the state, CSP Troopers had spent all morning coming to the rescue of drivers who had slid off the road. The drivers were behind the wheel of every type of vehicle, from small sedans to trucks and large SUVs -- but they shared one thing in common: they were all driving too fast for the current conditions. "After spending hours on I-70 that morning, and seeing firsthand how many people could have avoided crashing or sliding off the road by simply slowing down, it came to mind that a simple reminder might be effective in helping people get to their destinations safely," Trooper Lewis said. "CSP has always been a leader of education before enforcement. Basically: if we can teach people how to avoid crashing versus responding when they do, it is time well spent." 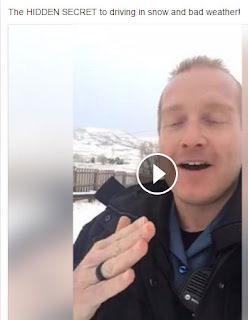 Trooper Lewis grabbed his phone and shot a quick selfie-video that he posted to the State Patrol's Facebook page. In the video, he tantalizes the viewer with an offer to teach them the super secret way to stay safe on winter roads. After a short build-up in which he adds that this information is also the secret to avoiding "cranky troopers" having to pull people out of trouble in freezing cold temps, Trooper Lewis reveals the secret: "SLOW DOWN." The slightly snarky video was an immediate hit. It struck a chord with drivers all across the world. The video quickly surpassed 1 million views and was featured on numerous local media outlets. Resulted in a spike of about 10,000 "likes" for the CSP Facebook page, driving the total "likes" from about 45,000 to more than 55,000 within a week. 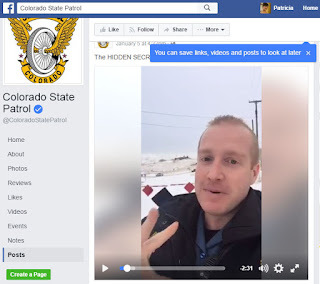 Trooper Lewis said CSP social media posts have achieved the million-plus viewership range before, but nothing has attained the numbers in the short timespan that this video did. "Our most popular social media posts involve either animals, tragedy, or sarcasm. I figured some people would respond to a little 'tough love,' but not to the degree of how far reaching it went!" He said. As for why he thinks the video was so successful, Trooper Lewis surmised it was a combination of the message's simplicity and its delivery. "Nobody responded with 'this is for me, I am a bad driver.' They always think it will happen to someone else, and so with a little bit of snark that makes it funny enough to get a chuckle, they shared it, thinking 'other people need this- but not me!'" Lewis said. He added: "It helped that it was timely, right at the end of a snow storm, so people literally just saw (or experienced!) what I was talking about." As for his brief moment of internet fame, he's taking the glory with a good dose of humility: "As for fame, well, if I had to be a police officer famous for a video on the internet, I think this may be a 'best case' scenario!"